The end of the school year is always filled with awkward scheduling situations. Kids are out for field days, field trips, testing, class parties, blah, blah blah, blah blah. I could continue listing all the things that pull them out - but you already know this. 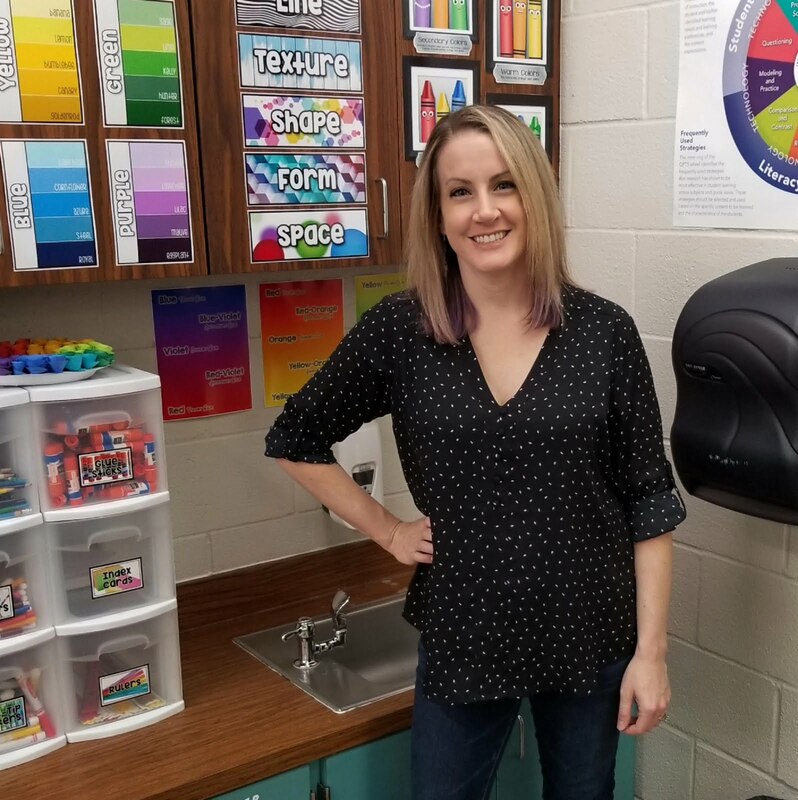 The point is, because of weird scheduling I needed a 2-3 day project I could do with my kindergarteners (I normally see them 5 days in a row). And voilà - Pinterest came through for me once again! This pin was taken from Artsonia. On the first day I had my kinders create a piece of painted paper with either yellow and green tempera paint or green and blue tempera paint (uh ohhhh NINJA colors! ... That's what I call intermediate or tertiary colors in kindergarten - it makes sense.. I promise.). 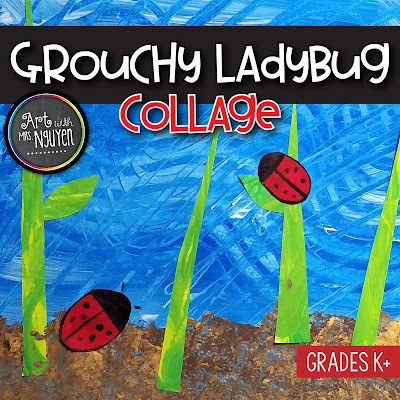 Students got to freely paint with these colors, overlap, blend, and add texture with a variety of tools (paint scrapers, bubble wrap, etc..). 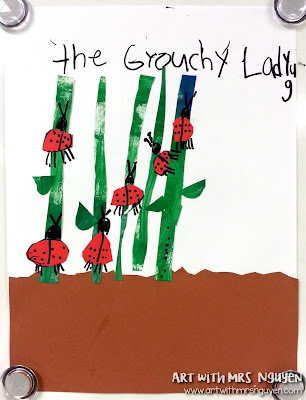 On the second day I had my students come in and meet me on the carpet to read the book "The Grouchy Ladybug" by Eric Carle. 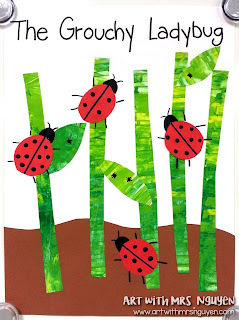 This book is probably one of my least favorites as I've said in a previous post, "I suppose you could say the underlying message of the book is that you should always be kind (like the friendly ladybug), however I found the more dominating message to be that sometimes grouchy people (errr- I mean ladybugs) deserve a good slap. Perhaps that’s just how I read it." After we read the book I demoed how to begin the project. Students were given a piece of 9"x12" white drawing paper and a piece of 6"x9" brown construction paper. Students were to cut a wavy line on the top of their brown paper (or they could opt to leave it straight) and glue it onto the bottom of their paper. 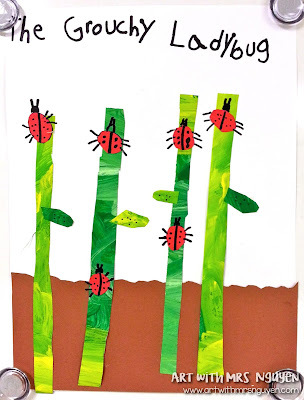 Afterwards, students began cutting out long skinny strips from their piece of green painted paper; these were layered on top (we also briefly talked about placement - the grass did not all have to be glued on top of the brown paper or at the bottom of their paper). Students could also cut out leaf shapes from this paper as well. 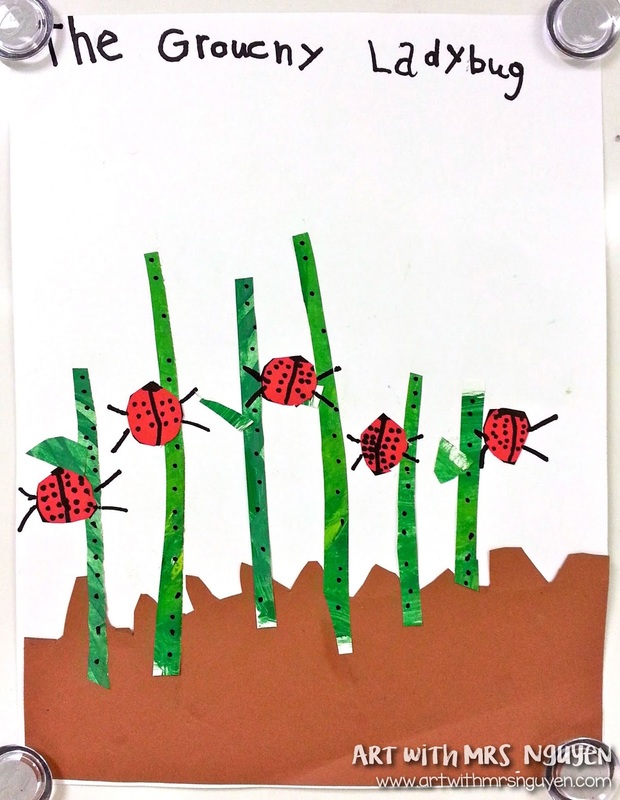 Once their greenery was added, it was on to the ladybugs! Most of my kinders had to do their ladybugs on the third day. In an attempt to incorporate some math into this project, I began by talking about symmetry and doing doubles math with my kinders. 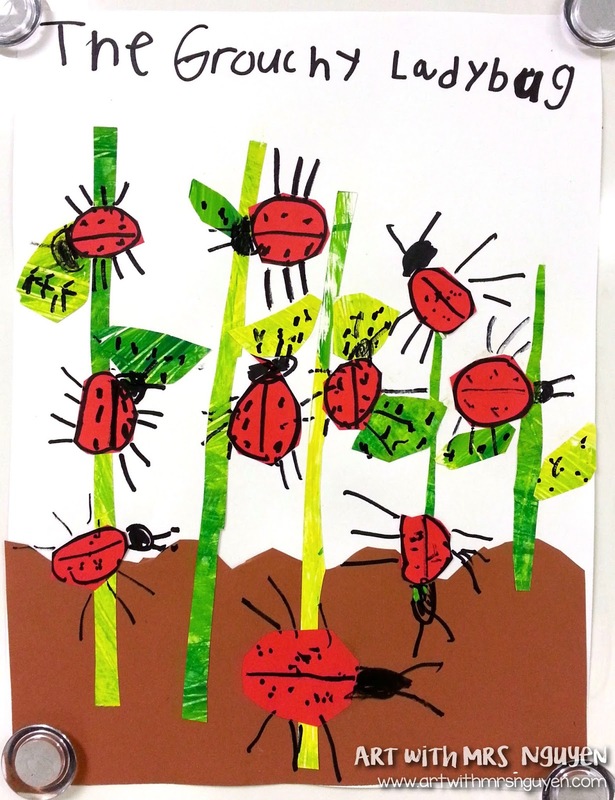 Then I gave them a challenge (they had the option to participate or not) - I wanted them to include symmetrical ladybugs that showed me doubles addition using the addends 1-6. 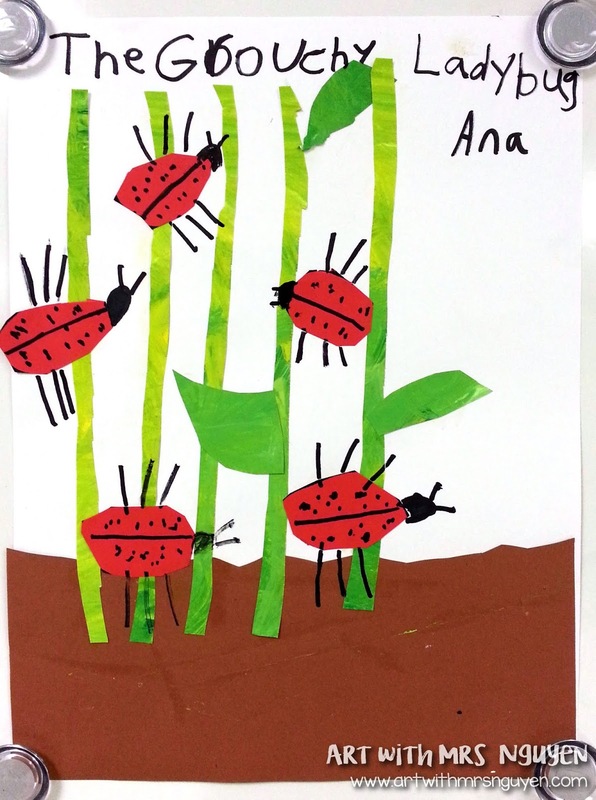 The ladybugs were created with red construction paper and the spots, legs, heads, and antenna were all drawn on with sharpie. Last but not least, I had my kinders add some aphids to the plants (those ladybugs sure are hungry! ).